UCSC biologist Dan Costa is featured in a new episode of KQED's QUEST TV program. In the segment "Why I Do Science: Dan Costa," Costa, a professor of ecology and evolutionary biology, describes his research on marine mammals and birds around the world and why he loves doing it. The program will be broadcast on Wednesday, July 27, at 7:30 p.m. on KQED 9 and KQED HD (Comcast 709). The segment on Costa can also be seen online at science.kqed.org/quest. Costa was previously featured, along with other UCSC researchers, in a QUEST TV episode on elephant seals, "Into the Deep with Elephant Seals." In a story on the QUEST web site accompanying the new episode, producer Sheraz Sadiq described working with Costa on the program: "Within the first minute of my interview with Professor Costa, I knew that he would make a phenomenal 'Why I Do Science' profile. 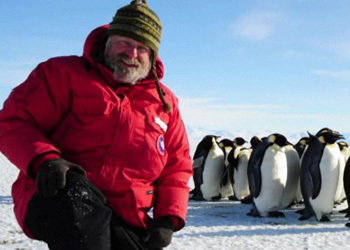 His nearly forty years of fieldwork around the world, to study a diverse array of marine animals, including albatrosses, seals and penguins, would provide a rich trove of experiences to mine and subsequently craft into a compelling portrait of a scientist passionate about science."